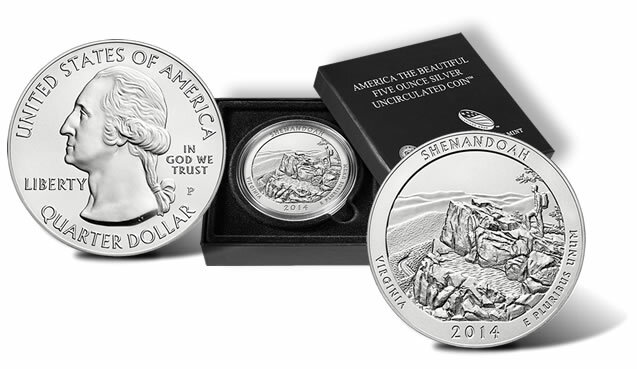 Released on Thursday, May 15, the Shenandoah silver coin hit sales of 20,120 by Sunday, May 18. The previous 2014-dated coin honoring Great Smoky Mountains National Park started with sales of 21,415, but its first sales reporting period went from Monday to Sunday. Both coins debuted to significantly stronger buying compared to issues since 2012, supported by a 10% subscription discount that has made their prices more attractive — $154.95 at the regular price versus the discounted price of $139.45 per coin. Mintages for the this year’s first two coins are different at 25,000 for the Great Smoky Mountains silver coin compared to 30,000 for the Shenandoah silver coin. Interestingly, the latest weekly 1,378 increase for the Great Smoky Mountains silver coin lifted its total to 25,421, which is above its stated mintage. Coin News Update: The U.S. Mint on Wednesday morning, May 21, placed the Great Smoky Mountains silver coin on its listing of sold out products. *Time periods for the first reported U.S. Mint sales of the 2012-dated America the Beautiful silver coins were one week or a day less than one week. Conversely, each of the 2013-dated silver coins have opening sales periods from Thursday to the following Sunday.